Here's the tough part of Winter, right? It's so dark and everyone is starting to grow a little weary of the snow and slush and thoughts of Spring are settling into our brains and taking root. I know that is where I am these days. Now that I am a Minnesota girl again I know I need to toughen up and I am trying. Last year, when Omaha had a rough Winter, my mantra was "Spring always comes." Whether you like or not it just does, without fail, every single year. That really did keep my spirits up and guess what - Spring DID come that year just like it will again this year. So, I made up this little design in honor of that hopeful voice inside that pushes you through the grey of Winter and maybe inspires you to go out and go sledding or take a walk in the snow because hey, before you know it, it will be gone and it will be Spring, right? You can download the pattern here. I included a stitch guide and a pattern piece cutting guide in case you want to sew fabric pieces together for your base like I did in my sample - but you certainly don't have to do that part. Enjoy and please let me know if you have any questions at all about this pattern. The gloom we have had has finally made me gloomy! Need some sunshine! Thanks for the pattern! This is gorgeous! I can't wait to stitch it up and have such a happy reminder that this ice and snow won't last forever! Very pretty. 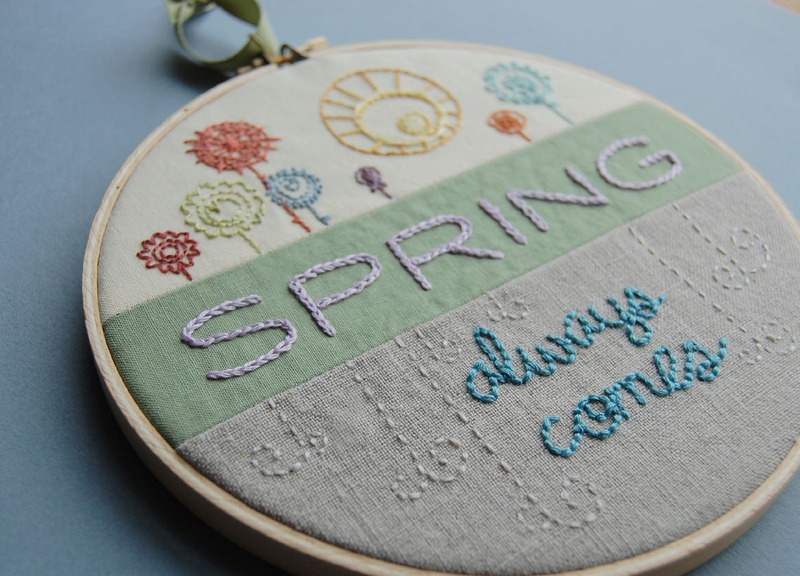 Your chain stitch on "Spring" is flawless!! That can be a challenging stitch to use for letters, but you make it look easy-peasy =). Thanks...our forecast says up to 7 inches of snow tonight. I might need to make this soon!! What a beautiful and uplifting piece. This made me very happy on a very cold morning! Thank you! So cute! Thank you for making the pattern available! Wonderful idea for the spirit! Thanks so much for sharing-I may get to this before Spring!! 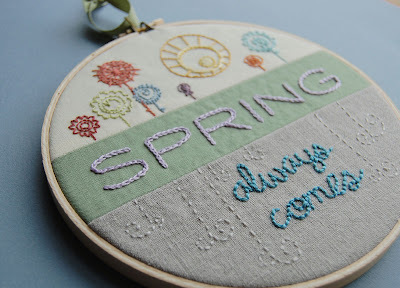 I found your "spring" Pattern via "Feeling Stitchy" and want to thank you for sharing. I look forward to looking around your blog. Love it! Any chance they'll be a nifty little one for every season? this is marvelous and you are so kind for share it!! 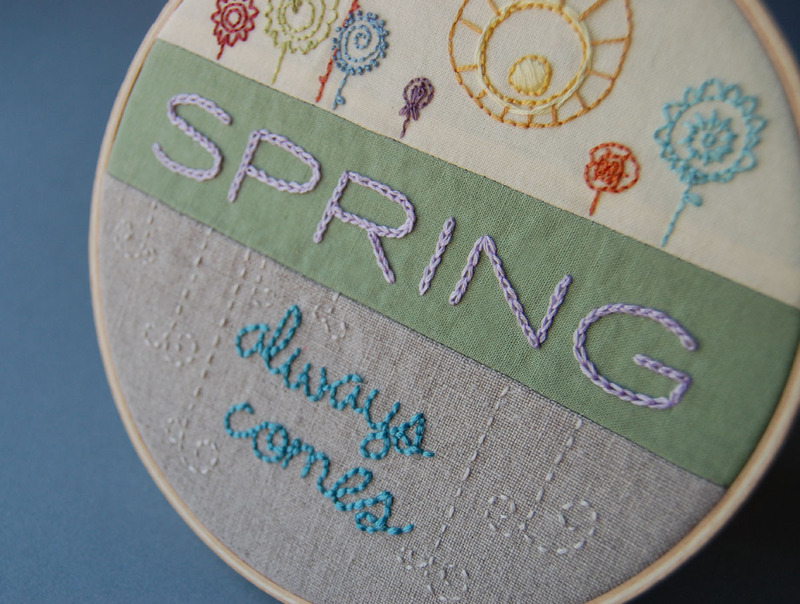 This is beautiful ... and even though we are in the midst of summer, I think I will stitch it! Thanks you for sharing it. Wow, I really need this sentiment for sure right now. Thank you! Thanks for the wonderful pattern. I'm going to enjoy stitching this. Thank you for the lovely reminder that spring will eventually be back. This is a beautiful piece.